Whether it’s crispy fried potatoes, steamed dumplings, or a creamy jelly roll stuffed with raspberries, no one makes food as good as a German grandmother — that is, until now! Featuring eighty-five classic recipes, from soups to Sunday roasts, and desserts to Christmas favorites, Grandma’s German Cookbook is loaded with recipes any German grandmother would proudly serve her family. They’ll also discover charming profiles of German grandmothers and their takes on classic dishes, for added authentic inspiration. I was interested in reading Grandma’s German Cookbook because we have some German background in our family. My Grandma B is German and I remember how much she loved to bake! Grandma B spoke German as a child, but as she got older she switched over to English. I took German for three years in high school though now in my 30’s, I forget most of it except for the basics. Don’t try talking to me in German because I won’t understand! There were many recipes that I was not familiar with, but sounded delicious like Graubünden Barley Soup and Rote Grütze (Red-Berry Pudding). Both of those are on my list of must-tries. I did recognize the recipe for Cheese Spatzle, but will need to find a Spatzle Maker to make it. Schupf Noodles are popular in Germany. They are potato dumplings shaped like fingers. I’m betting this recipe will be popular in our home. All the ingredients are items I have on hand and aren’t expensive. One of the most well-known German dishes is also included: Weiner Schnitzel. It is paired with a recipe for Potato and Cucumber Salad. I really enjoyed how extensive the dessert section is. Many of them I hadn’t heard of but after looking at the ingredients along with the picture, I’m excited to give them a try. I’m curious to see if they remind me of my grandma’s desserts. I guess we’ll see! In the chapter, The Good Provisioner, there’s lots of tips and tricks to help you in the kitchen. I enjoyed the section about Grandma’s Best Secrets. Have you ever had a cake that won’t come out of the pan? Grandma’s Best Secrets shares a simple fix. Grandma’s German Cookbook is a perfect for those of you who want to explore your German heritage or just have an interest in trying out another type of cuisine! This sounds like a really interesting recipe book! I’ve never really cooked “German” before but I’d like to learn! omg, i was just talking about my grandmother’s german cooking earlier today! we are 100% german! Fun – we just went to “Schmeckfest” over the weekend and tried all the different German foods, so we’re on a German kick now, too! I lived in Germany for many years and miss the food. It’s hard to find German ingredients withourt costing an arm and a leg. This book sounds like I don’t need to order special ingredients and I like that a lot. Great review. Really enjoyed hearing about how much this cookbook had to offer. I also appreciated the amazon.com link. Thank you, Stacie. Looks good! Dont eat much german food! I like to try different cuisines. This would be great. As a German I would like this book. I love spaetzle especially! I’m excited about this cookbook even though I don’t have German heritage, thanks! My aunt is German and always makes the most amazing meals. I’d love to learn to cook like she does. 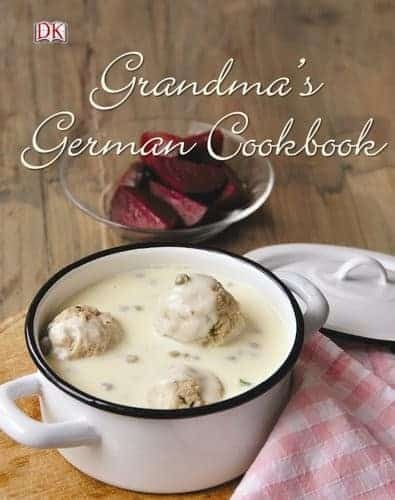 I am German so would love this book to make some of the recipes I grew up on! The recipes you talk about sound as heartwarming as the recipes my slovak mother used to cook for me…. This looks like a really interesting cookbook. We had a German Grandma come and stay with us: she taught me how to make spaetzle but I lost the recipe. This would be a great cookbook!